The Solution below shows the D# melodic minor key signature on the treble clef and bass clef. This step shows the D# melodic minor scale key signature on the treble clef and bass clef. This melodic minor scale is based on the natural minor scale with the same key / tonic note - D# natural minor scale. Since the natural minor key is itself on the Circle of 5ths - D# minor on circle of 5ths, this means that this is a commonly used melodic minor scale key. 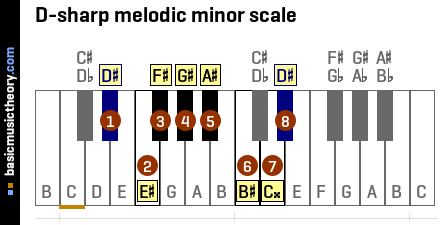 This scale sounds the same as the Eb melodic minor scale, which is also a commonly used scale. The same notes are played in the same order in each scale - they sound identical. Only the names of the individual notes are different. The D# melodic minor scale has 6 sharps, 1 double-sharp. However, melodic minor key signatures use the natural minor key signature of the same key (in this case - D# natural minor key signature) next to the treble clef, and then the differences between the two scales are shown as adjustments next to the note names on the staff. To understand why the D-sharp melodic minor scale has 6 sharps, 1 double-sharp, have a look at the D# melodic minor scale page, which shows the music theory rules for identifying the note positions and names for this scale. The D# natural minor key signature has 6 sharps, which is different to the melodic minor scale above. To calculate the D-sharp melodic minor scale from the D# natural minor scale, the 6th and 7th notes position of the natural minor scale - notes B and C# are both raised by one half-tone / semitone, as shown in the next step. This step shows the D-sharp melodic minor key signature on a treble clef musical staff, together with a table showing the note adjustments that need to be made relative to the natural minor scale.